Kenny Rogers poses with his brand-new star on the Music City Walk of Fame Photo by Earl Flippen, Jr.
NASHVILLE, TN — Among family, friends and fans, country music/pop legend Kenny Rogers was inducted into the Music City Walk of Fame last week. The induction ceremony took place one day before the all-star “All In For The Gambler: Kenny Rogers’ Farewell Concert Celebration” at Bridgestone Arena. The Oak Ridge Boys strike a pose with their long-time friend Kenny Rogers after the ceremony. Photo by Earl Flippen, Jr.
Music City Walk of Fame Inductees are recognized for their significant contributions to preserving the musical heritage of Nashville and for contributing to the world through song or other industry collaboration. The country/pop music legend has sold more than 120 million albums worldwide, topped the charts for nearly six decades, famously been a duet partner with Dolly Parton, is a New York Times best-selling author, appeared in movies. Rogers was inducted by his long-time friends, country music superstar group the Oak Ridge Boys. The two music powerhouses have often toured together over the years. 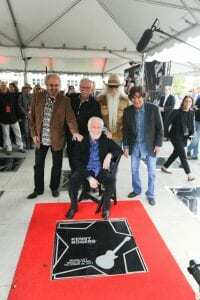 Kenny Rogers received the 80th star on the Music City Walk of Fame.